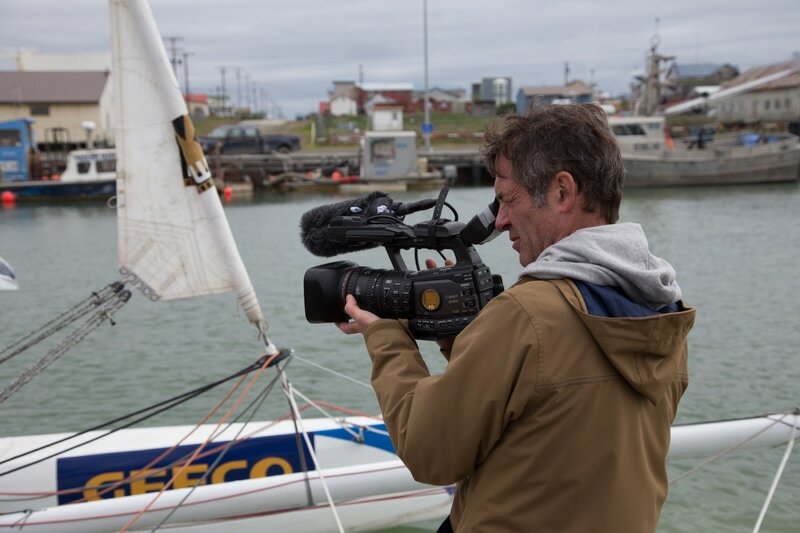 Follow-us to Nome, Alaska and meet Yvan Bourgnon, during the final preparations of his world's first attempt to sail the North-West passage on a 21ft catamaran with no cabin. 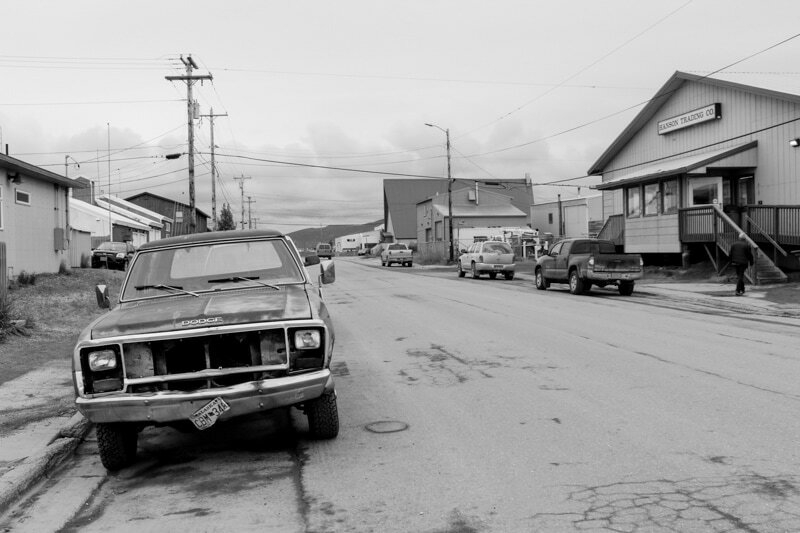 Tomorrow is our last day in Nome. Ma Louloutte is ready, except for the trampoline which suffered a tear and is being fixed by a local professional. A stressful wait now begins for Yvan. Could be two days, a week, maybe two before the best ice and wind conditions allow him to set sail. 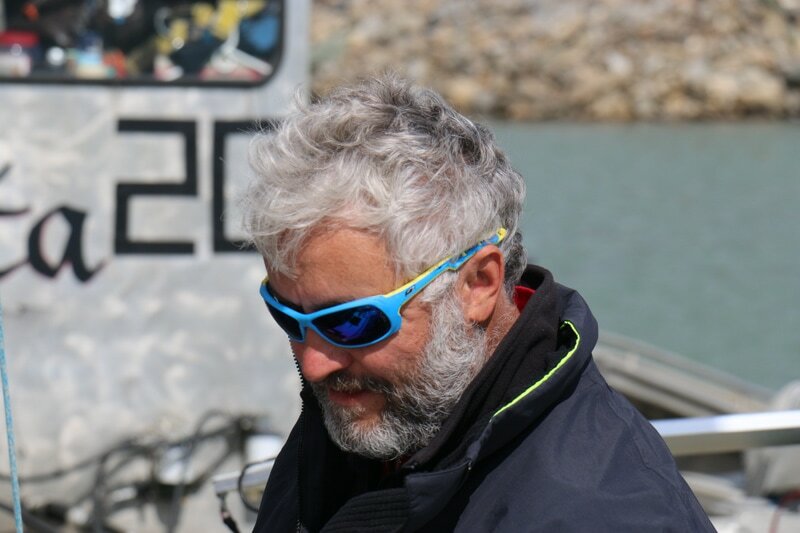 He cannot wait too long though; the waters of Baffin Bay get nasty in September. Didier C. and the TV crew will stay with him until he departs. 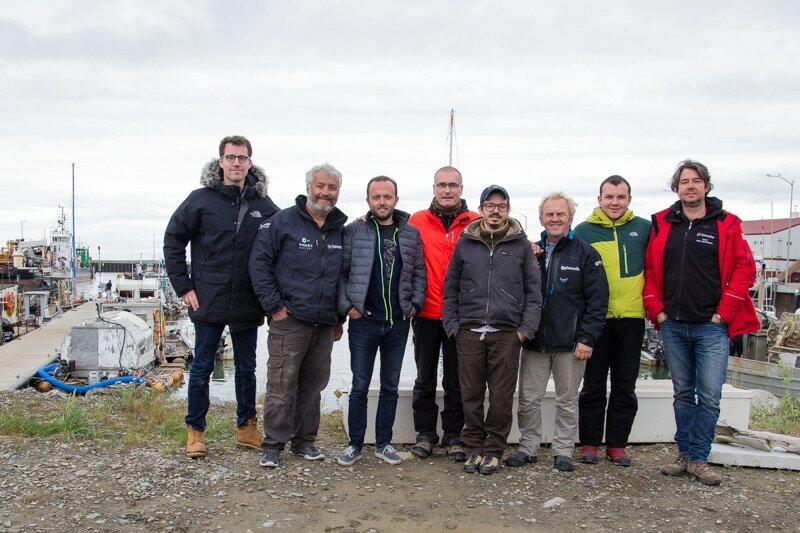 Of the many risks that await, one is of particular concern to the sailor: the absence of wind, which is very frequent around the pole. No wind means the cat -which has no engine- could become less maneuverable and drift. It would also give polar bears a greater chance to jump on the trampoline. During his world tour, Yvan’s boat had been boarded by a trio of sea lions in the Galapagos. A cute yet stinky encounter. The heavier and more aggressive bears may not be as good a photo-opportunity. After a week here, we have gotten used to the seemingly slow-pace of the city and to its people. 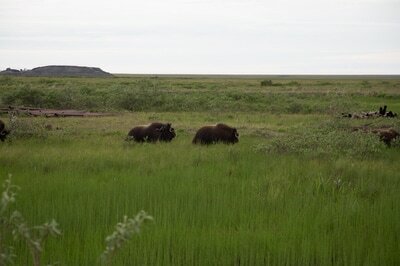 But there is a lot more to see than we had imagined. 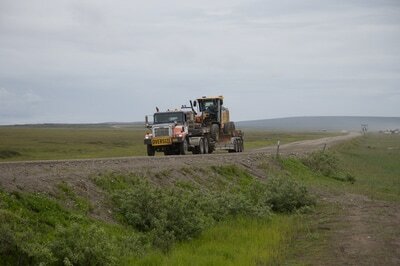 We drive around Nome’s gravel roads which point East, West and North. 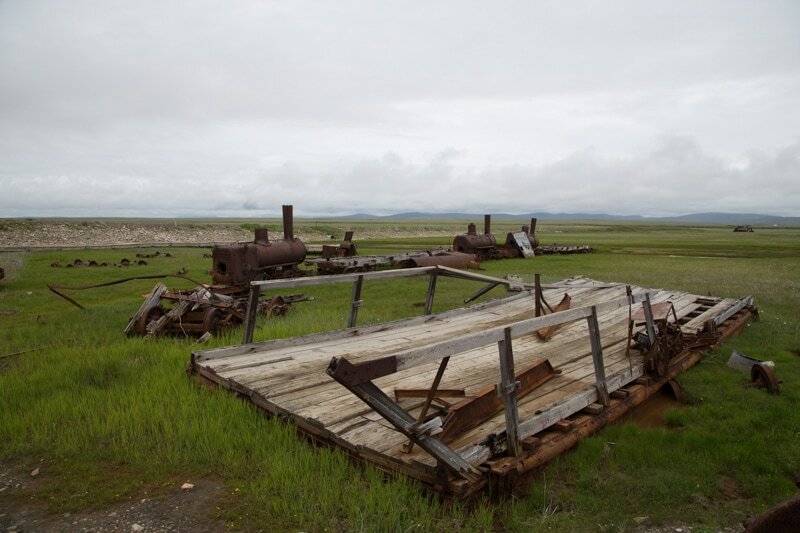 We first make it to Solomon where we find the wreck of the railroad that never was (only some of it was used for over twenty years in the 1900’s). The New-York-funded project was cancelled after its builders realized the ground was not stable enough to support a train. 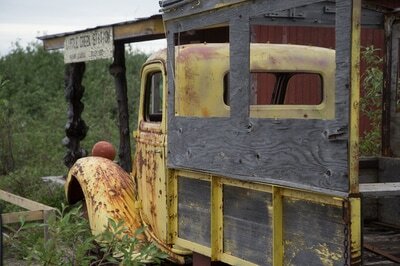 So they left everything there to rust, for over a hundred years. 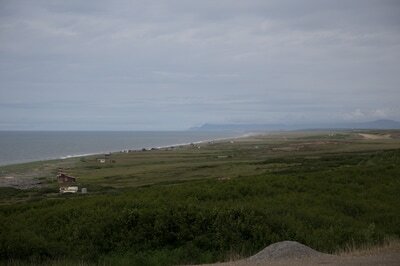 The landscapes are breathtaking. 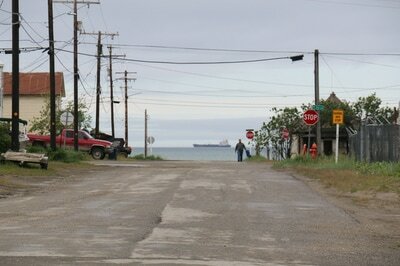 On one side: the sea, which today is relatively calm, giving gold-dredges a chance to venture outside the harbor. 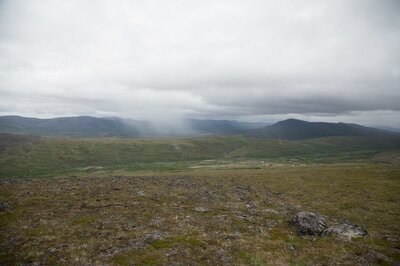 On the other side: the mountains, where patches of snow can still be seen this late June. Given enough time, we would carry on until the road ends. Nature is surprisingly untainted; we were expecting dirty rivers and plastic detritus but find none of that (1). We understand why the place is the ideal final stage for the Iditarod Trail Sled Dog Race, an annual 1,000 mile-long sled dog race run in early March from Settler's Bay to Nome. 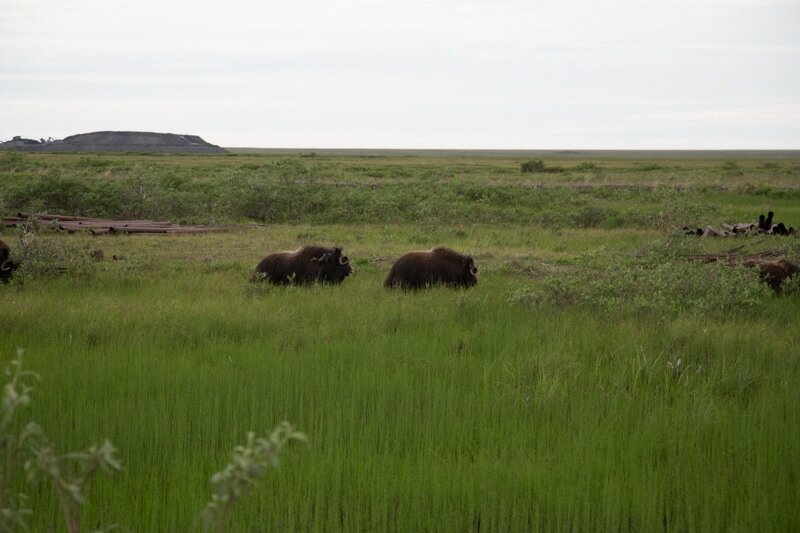 We push westward into land, looking for bears and moose. No luck. 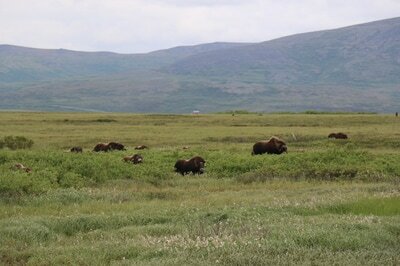 But we do find a group of Muskox. 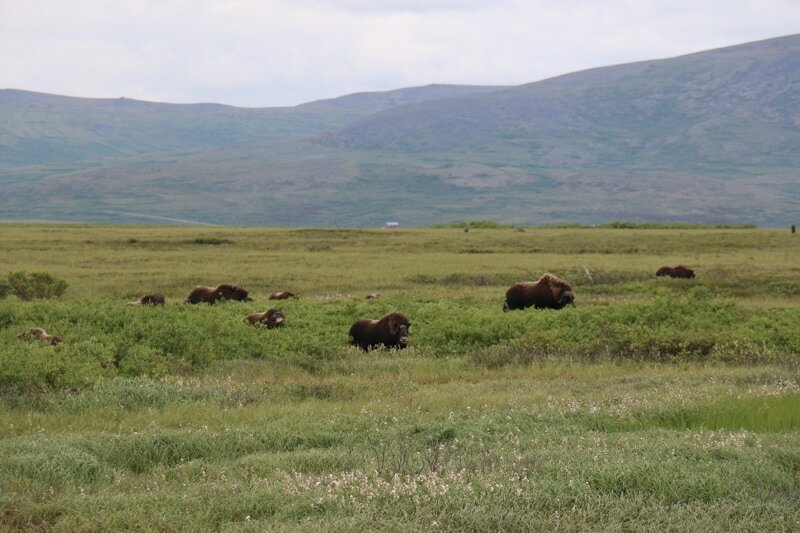 They are grazing near a 10-seater plane wreck which must have lost its tail as it hit the ground. 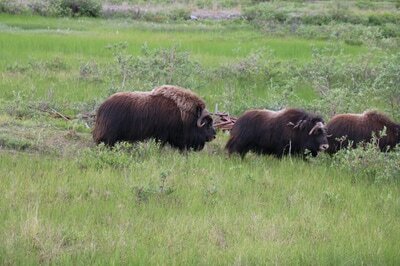 The Muskox are evidently protecting the young ones so we maintain a safe distance. Nearby, the remnants of a gold-era fun park can be seen. It does not take much imagination to visualize what it looked like. 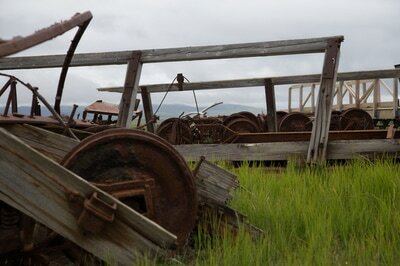 Everything is well preserved. It’s as if our car stood as the odd one out in this Back to the Future decor. Five more miles and we are at the top of the mountain, overlooking Nome. A quartet of six-story-high antennas built during the Cold War still point towards Russia. But it’s unlikely they are being used as the surrounding fence is crushed to the ground. 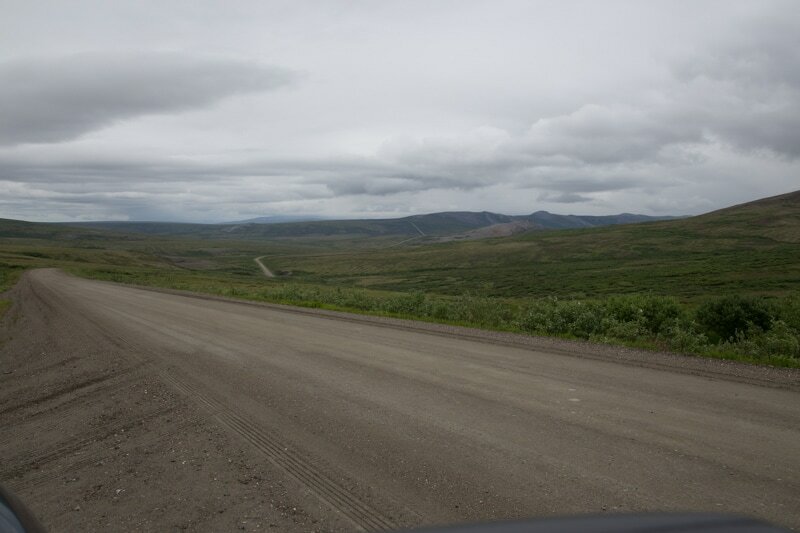 Thirty miles later, we cross a bridge over the Sinuk river. Locals are fishing. There is so much salmon that all they need is to do is throw the bait in the middle of the pack. And pull. Food is expensive is Nome, as is everything else. So the locals rely on fishing to feed their families. The day is drawing to a close. Time for us to return home. We say our goodbyes and slide into our bunk beds one last time. Merci Yvan, et bon vent à toi! This is the end of this blog, we hope you enjoyed reading it. We also recommend reading ‘Gladiateur des Mers’, the story of Yvan’s round-the-world trip (French-only). (1) However, all of Nome’s trash is buried in a landfill near the city. It's 5PM and sea trials can finally begin. Didier and Yvan spent most of the day packaging 70 days worth of food, with a double portion for July 6th, Yvan's birthday. Planning is meticulous; the duo will mentally recount the Ziploc bags until dinner. Yvan, Didier and Pierre head out first on ma Louloutte. In spite of the active dredging, the harbor channel is so shallow you have to aim straight for the middle. 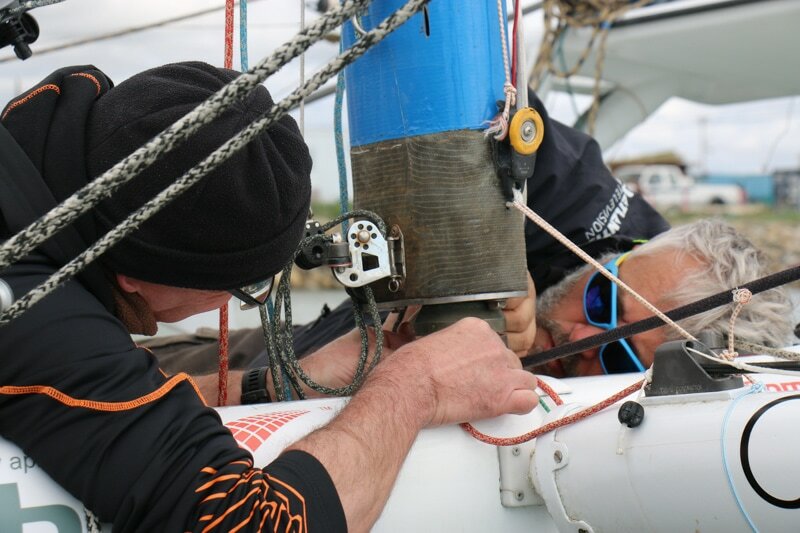 Easy when you have 200 horses affixed to the stern, slightly harder on a sailboat. 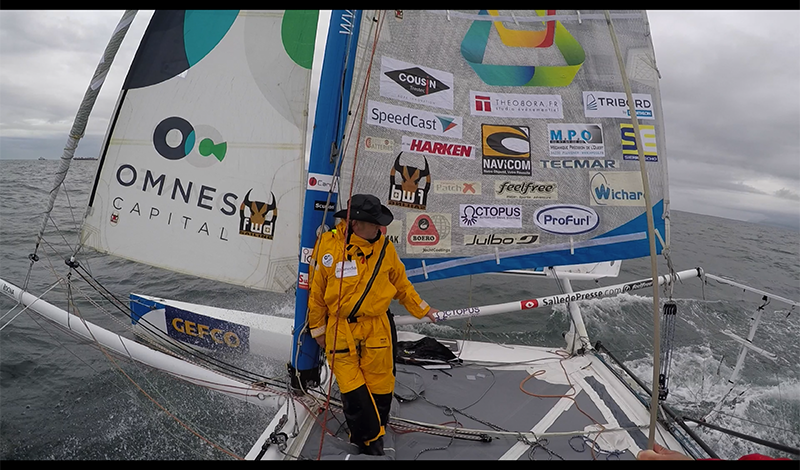 The cat responds as expected so Yvan is happy to bring us onboard. 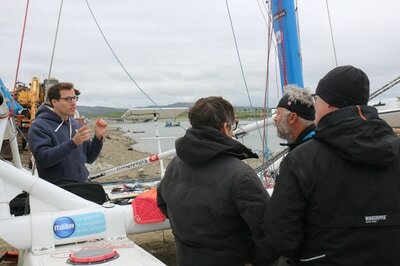 As soon as we're past the breakers he hands us the stick, giving us control of his beloved Louloutte. 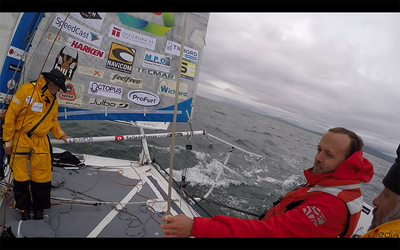 Meanwhile, Didier kneels under the boom to give us space, taking on wave after wave until we figure it out. 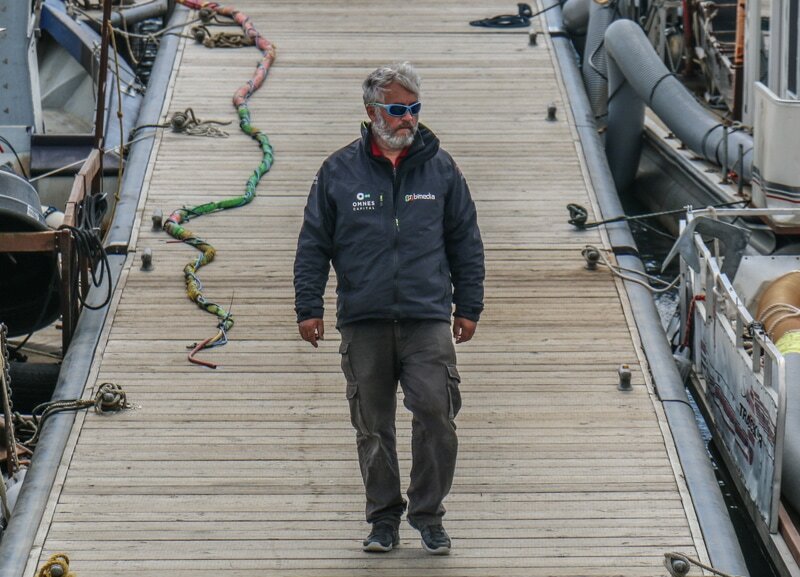 At 7.30PM, the harbor master radioes us back to the pontoon to make way for a 260ft research vessel. 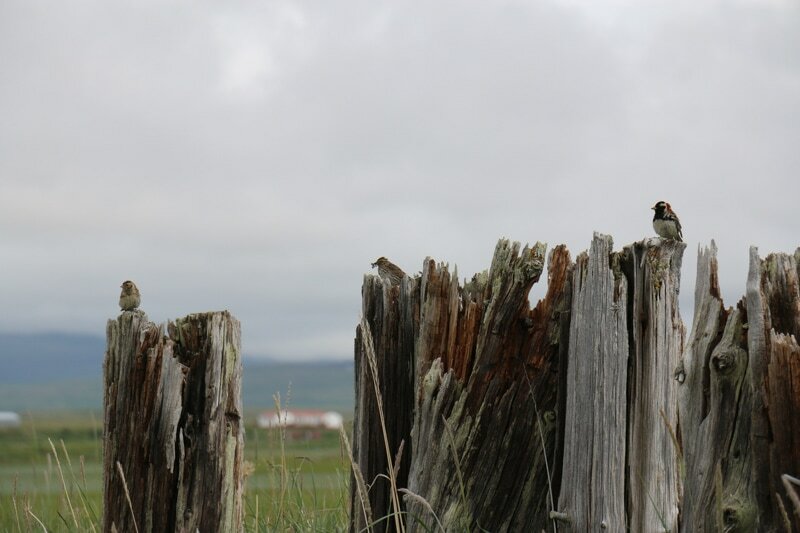 The ship has been out and about in the Bering sea studying bird populations. Birds are ideal to study in order to understand what goes on in the water. Indeed, they sit at the end of the food chain: plankton eat plastic, fishes eat plankton and birds eat fish. According to researchers, climate warming has severe effects on the sea's fauna: predators are getting bigger and diseases spread faster. Plastic pollution acts as a toxic catalyst. The data is there to prove it: correlation is strong and causality obvious according to Catherine, a French-speaking Hawaiian researcher whose use of R-Stats is something she's willing to discuss over a beer. I wish my use of R involved a federally funded cruise. It won't last she tells us, as the mission is about to get defunded. As we carry on talking, I get the conviction environmental variables are to become incontrovertible regressors in our financial models. ​It's close to 2AM and the light is like a never ending break of dawn. Soon we’re good to go. We place two sets of big wheels under the cat’s hulls and head for the loading dock. No truck involved, we’re doing this the green way. The other Didier and I put our shorts on as our feet may get wet. The water is at a cool 7.5 celsius and I am hoping Yvan won’t have to get in it during his trip around the pole; it will never be as warm as down here. But the wind keeps on pushing ma Louloutte back towards the shore. So we go a little deeper… It’s not long before Didier and I are immersed up to shoulder level, pushing hard on our numb toes to keep the boat steady while the harbor crew fights Murphy’s law (engine failure, followed by cable stuck in propeller, followed by drifting towards the sharp rocks). 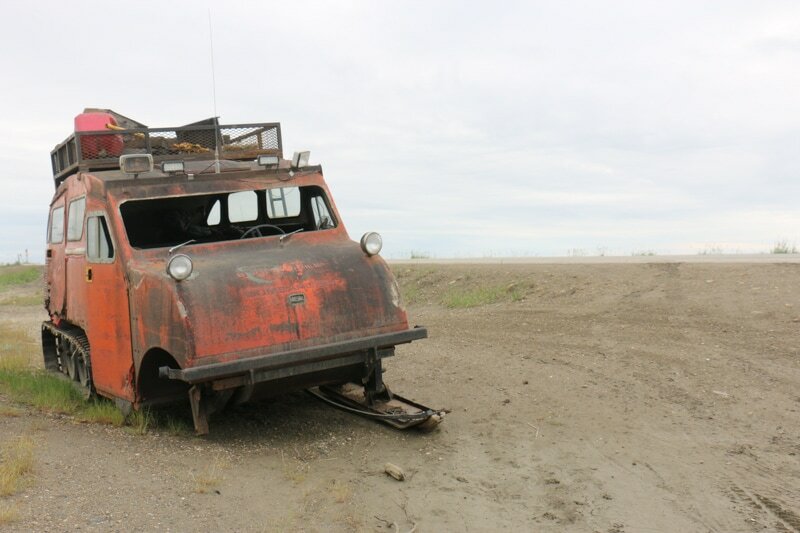 Fifteen minutes and a thousand burnt calories later, we get out of the water and into a local’s truck, who had kindly left the heating running so we can quickly get warm again. We’re staying at Rick’s house, a friend of Richard the mayor, himself a former Broadway performer. 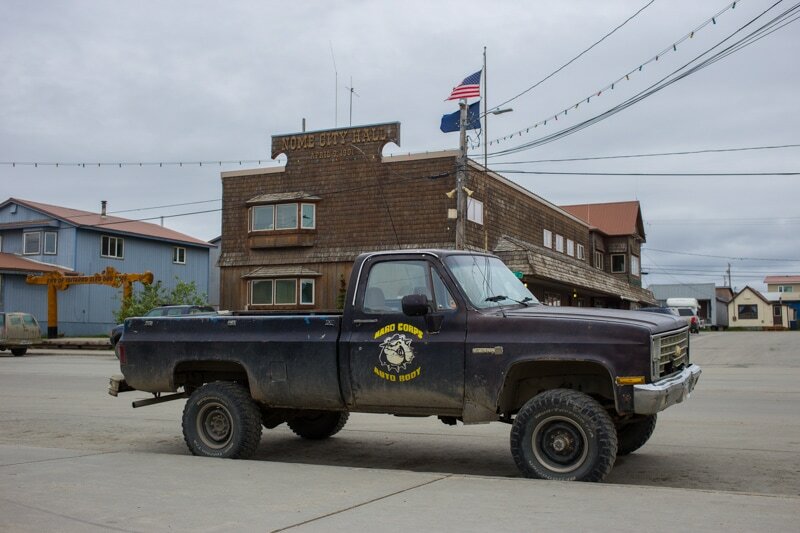 Rick spends half of the year in Denver, Colorado, the other half up here in Nome. 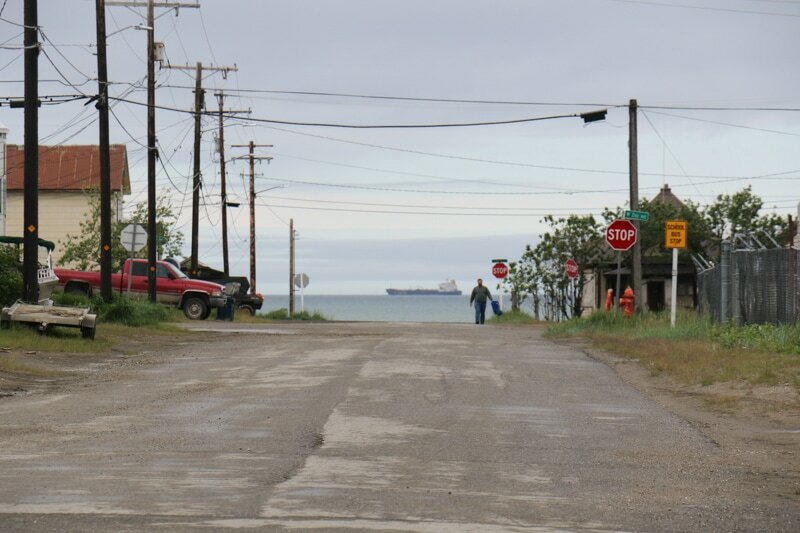 He’s passionate about Nome’s gold-rush history and recently bought a piece of land where the old Banner Creek Railroad station used to sit in the early 1900’s. Nowadays, you can barely see the tracks and roads used by the 40,000 prospectors who traveled to the Seward Peninsula during the gold rush. We’ll be checking the area tomorrow. It’s now 10PM and we’re having dinner at Milano’s Italian & Japanese food restaurant for the second day in a row. Yvan passes out for a few minutes, completely oblivious to his surroundings, then comes back to the conversation. I guess we just witnessed one of the many flash-naps he’ll take over the next two months. 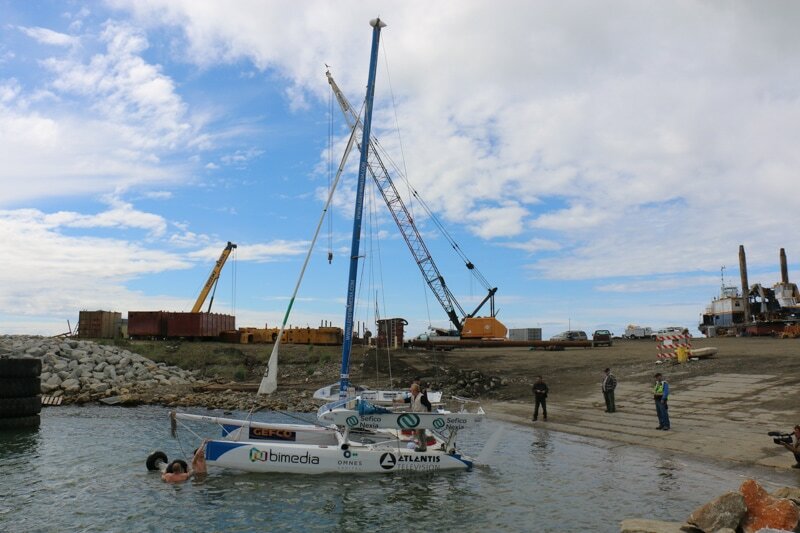 ​The boat is ready for technical trials and we’ll take it out to sea tomorrow, testing the electronics, the sails and doing some maneuvers. Yvan wants to set sail as soon as the ice permits. Next Monday, maybe. People don't stay in Nome unless they're working on a gold-digging dredge. 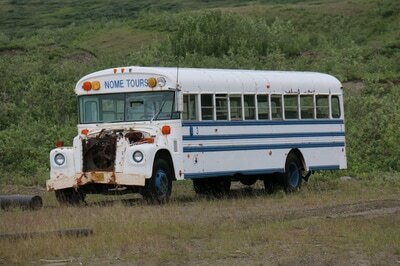 Soon after we landed, one hundred-and-fifty plus passengers evaporated from the parking lot. 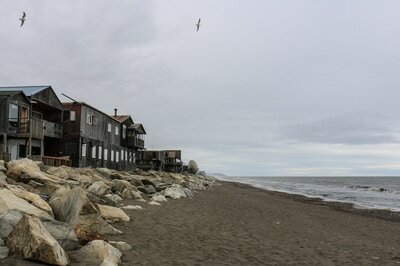 The town -a mere mile-and-half away- didn't get to see any of them, except for the four of us. We are joining Yvan Bourgnon, Didier, Pierre wand Rémi for the week. The first two are seasoned sailors. 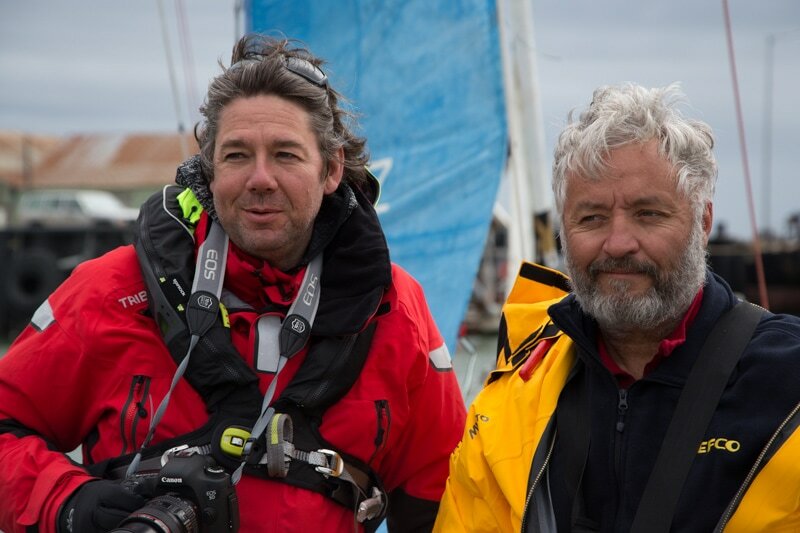 The last two seasoned journalists, working on a documentary about Yvan and his boat -ma Louloutte- for French TV Canal Plus. But we have no idea where they may be and the sketchy GSM network isn't helping. Therefore, our 24$-2-minute taxi ride ends on the sidewalk of Front Street. Leon -who manages the Visitor Center- had spotted us tourists from a mile away; he comes out to greet us. People are nice here, doing their best to make us feel welcome while getting a bit of social interaction in return. If Elon Musk wanted to fake a Mars landing, Nome would be the perfect shooting location. 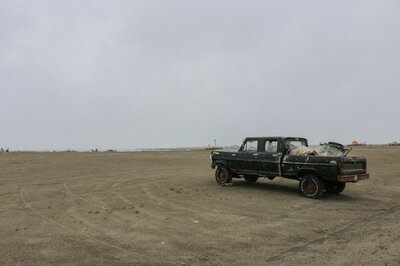 The light, the soil, the fog, the utter desolation and the cloth-piercing -drizzle all make for a dramatic scenery. 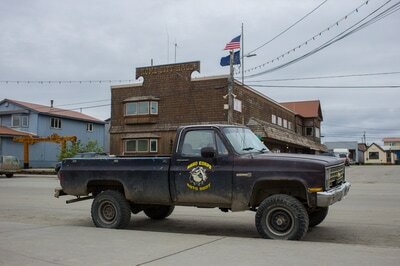 If you've ever watched Bering Sea Gold on Discovery you'll know what I mean. 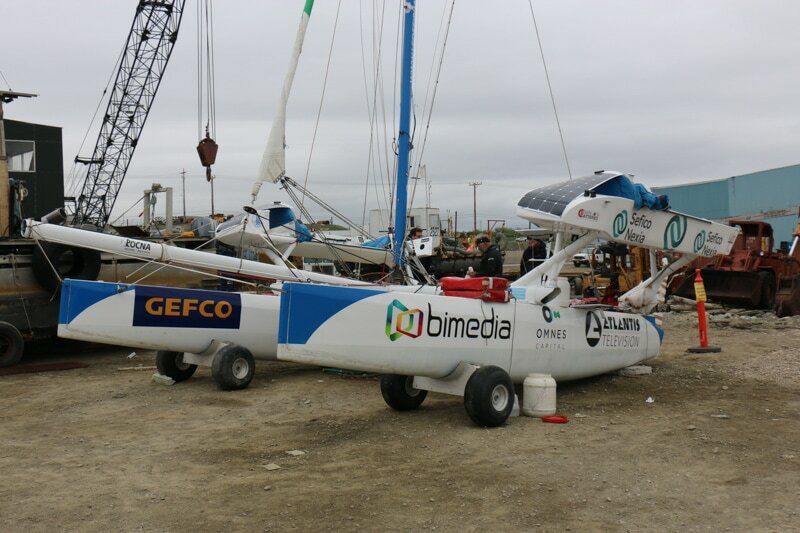 Emily Riedel and her Eroica crew are actually parked right next to Yvan's catamaran, working on the engines of their massive Mad Max rig. Massive compared to ma Louloutte. 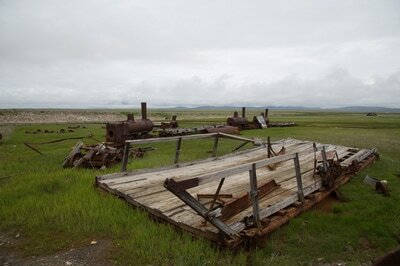 And massive by Nome's dredge standards. 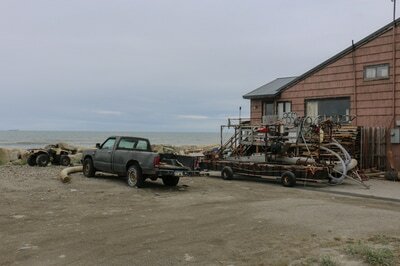 Most rigs and re-purposed dinghys with a pump and a few pipes coming out. Barely sea worthy when they came off the line, definitely deadly now. Yvan gave us a good lesson in management yesterday. He let us work on the boat after a brief assessment of our skills. Somehow though, I ended up in the starboard hull dismantling the new auto-pilot. 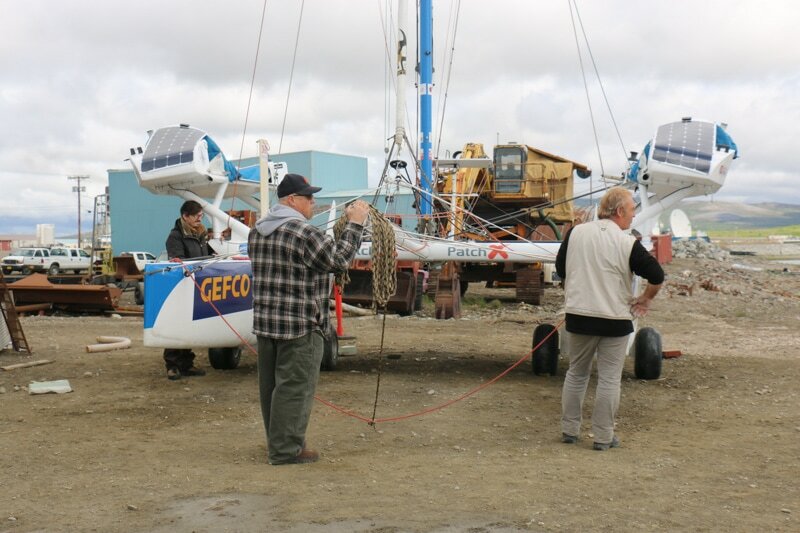 I was amazed to see Yvan trust us with the very things his life will depend on for two months while he's up there. And again, he seems calm even when no solution is immediately in sight (as of morning of Day 3, everything is back in good working order). So things end up working somehow. Yvan does a lot of other things in the background, calling people, finding help, etc. He's like a duck, pedaling hard under the water line. 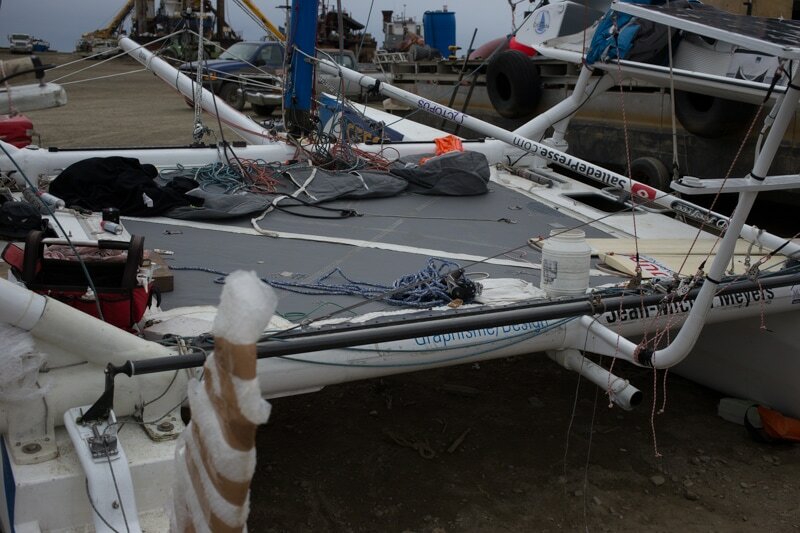 The boat will be back in the water tomorrow. 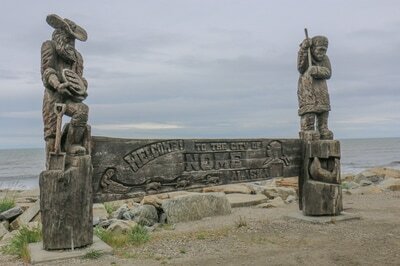 I'll post more pics and tell you a little bit about our host Rick, a Denver man with a plan for Nome. It's midnight and still day. We're exhausted. Having a kid affects your brain’s wiring. You feel the urge to re-assess what really matters in life. But as I sit in the UFO-shaped Terminal A of Newark International waiting to board my flight to Anchorage, I begin to wonder whether I got my priorities right; I just left my pregnant wife with our thirteen-month-old boy at home for an entire week. 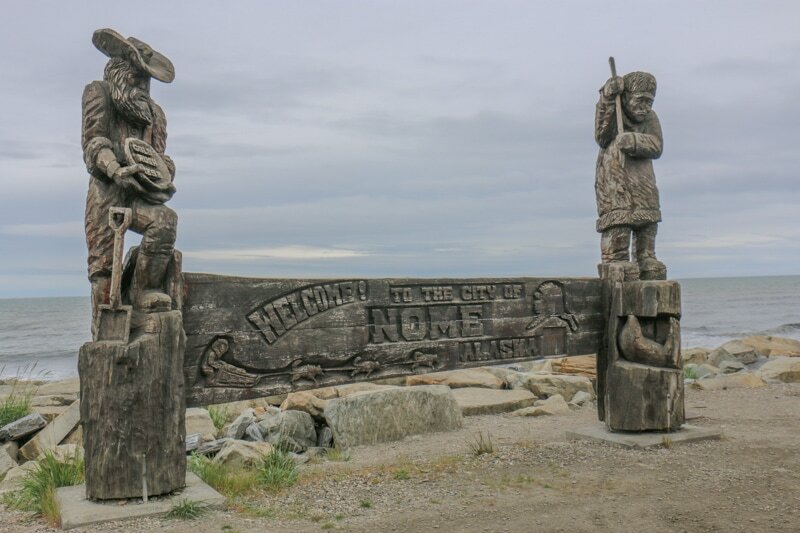 They say “it’s the trip of a lifetime” and I can only concur as I am unlikely to ever again set foot in Nome Alaska, a place I am yet to discover. 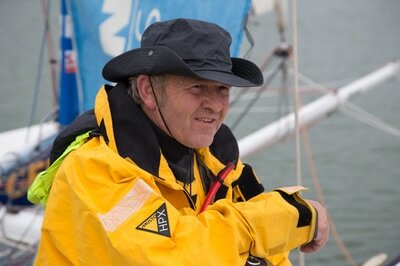 By Yvan’s own admission -the same guy who nine months ago invited us there conditional on a small fee- there is nothing there to do… I should trust the man’s word: he spent eighteen months sailing solo around the world on a 21-footer catamaran with no cabin (yes, you read that right). So it shouldn’t take much for him to picture civilization: a shack with a roof and a hot shower probably. As for me, it starts when the wifi upload speed crosses the 50MB mark. 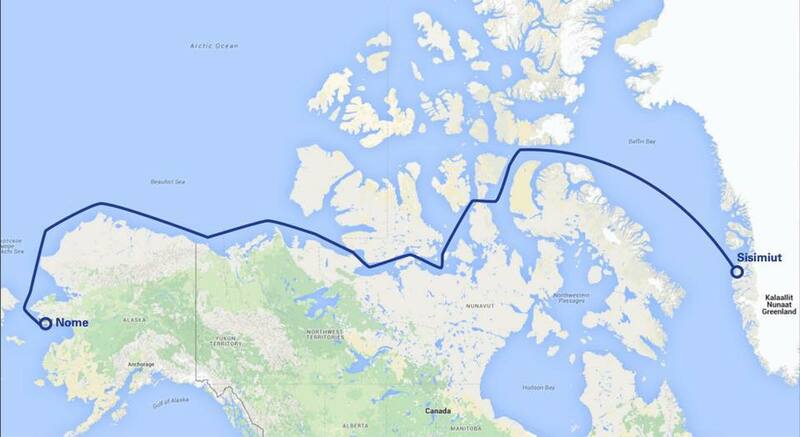 Yvan is getting ready to embark on a two-month long journey from the Pacific to the Atlantic ocean, via the polar circle. He will only sleep ten minutes at a time when he deems it safe, watching for playful polar bears and uncharted rocks. Crazy, right? Especially when you think Yvan had a baby just last week… But he has a dream and the will power to make it a reality. Last year, he started a non-profit called the The Sea Cleaners which aim is to build a gigantic cleaning ship powered by renewable energies. Yvan Bourgnon is a professional sailor who has been roaming the world oceans since age seven, he knows the oceans well. So people listen when he delivers his recent assessment of Mother Nature’s health. It’s a gloomy one: soon there will be more plastic than fish in the sea. Time is of the essence. Yvan’s motivation sounds legitimate to most of us. Naturally, we want to leave a better, safer, cleaner world for our children. But then we take the weekly trip to Walmart and buy what’s affordable and pleasantly wrapped in glossy plastic. 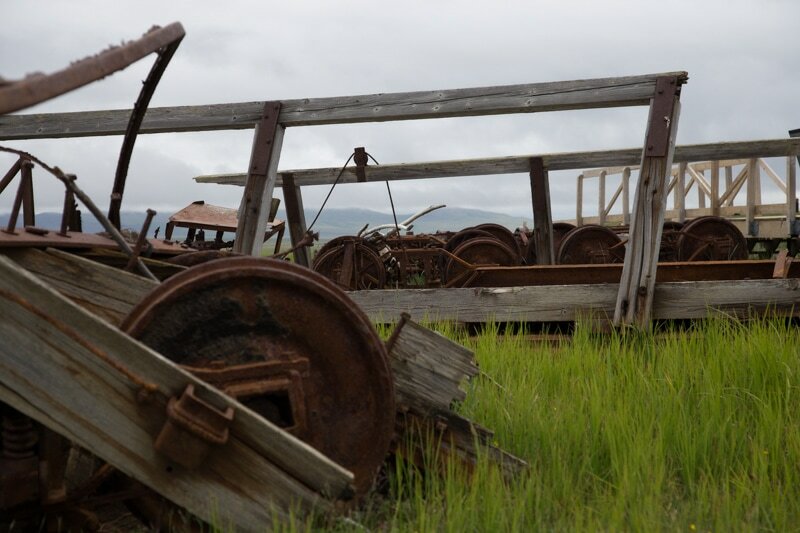 Oftentimes, we promise ourselves it will be reused, only to discard it unsorted 72 hours later with a sense of guilt lasting about the same as a sequence of Fixer Upper between two commercial breaks. I agree with Yvan. Something must be done. And when my mind wanders a little too much, I imagine fancy machine learning algorithms sorting our trash for us. I even reached out to Facebook’s head of AI Yann LeCun about it. There is something else though. My associate Fred B. and I just started Neon Risk, a FinTech & consulting company giving us the chance to do what we love, on our own terms. As an entrepreneur, nights can get pretty short and you can drown yourself in the details, panic a little and lose sight of the big picture. Yvan seems to have overcome this issue (except for the sleepless nights part which he’s chosen to embrace). He has embarked on two unbelievably difficult projects, one of them where his life will be at stake. There is much to learn from a guy like that. He’s facing tremendous obstacles but trusts his self to find a way. Fred B. and I are risk managers by trade. We spent the last decade building risk management models to help banks set aside the right amount of cash to cover for rainy days. As we now read about the economic impacts of climate change and start linking those to the world of Finance, we can no longer remain oblivious to the bigger risks. Let me take and example: some areas of the States now get so hot in the summer that planes cannot take off because the air isn’t dense enough at ground level. This forces airlines to cancel flights. And if those airlines start losing money and can’t repay their loans, banks will -in turn- suffer.